The tree of life painting that I recently completed is part of a series exploring the tree motif as a way to portray networks and ecological order. The tree motif is very abstracted and broken up in some of these, for example “Out of Balance”. “Dreams of Awakened Souls” has clear organic plant-like forms, while “Keystone” features a definite tree shape, but the details resemble xylem and phloem microscopic structures rather than twigs and bark. “Tree of Life” is the most tree-like and is bang-on subject. I have the canvases stretched in preparation for more very tree-like “Tree of Life” versions. There’s so much to explore in terms layers (of paint), textures, incorporation of lenses and other objects, and just making paint do cool things. It seems like a good idea to refine some very simple tree abstractions at this point. 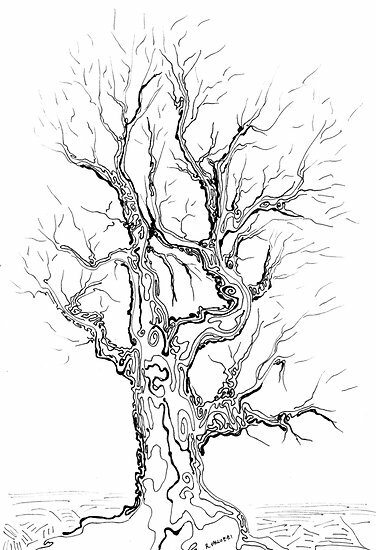 I have two ink drawings to share with abstracted tree motifs. The first is an abstracted Oak, the second is a birch. Both focus on woody structures – bark and branching patterns. In “Oak Study” I tried to capture the overall shape of the trunk and branches for many oaks I have known. Rather than explicitly sketching and shading the bark texture I used concentric dark and light light lines and whorls to convey both “roughness” and “roundness” I think a variation of this might also work for Elm. Birches tend to grow more straight and vertical than Oaks. They have a characteristic striping pattern on the bark of wide trunks and larger branches. This fades to a delicate nubbling on the smallest branches. 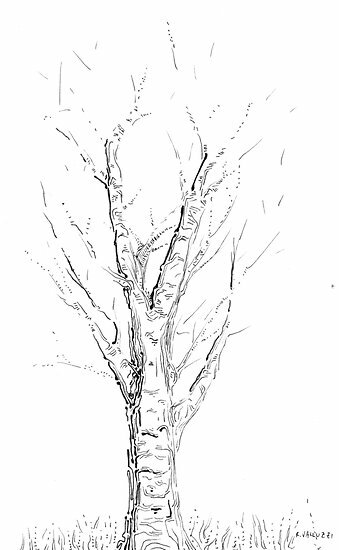 Here’s an abstraction of the ideas presented by a white birch. This is a topic which is near to my heart… Maany thanks!